Thu, September 14, 2017 7:30 P.M.
A “fiction pioneer, toying with fresh ways of rendering experience and emotion” (NPR), Nicole Krauss is the bestselling author of the acclaimed novels Man Walks into a Room, The History of Love, and Great House. Named one of Granta’s Best Young American Novelists and The New Yorker’s “20 Under 40,” she is the winner of the Saroyan Prize for International Literature and a finalist for the National Book Award, among many other honors. In Forest Dark, Krauss interweaves the disparate paths of an older lawyer and a young novelist searching for transcendence in an Israeli desert. 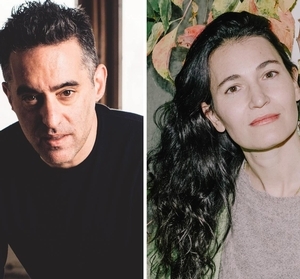 Nathan Englander is the author of the story collections For the Relief of Unbearable Urges and What We Talk About When We Talk About Anne Frank, a Pulitzer Prize finalist and winner of the Frank O’Connor International Short Story Award. In addition to his widely anthologized short fiction, he is the author of the novel The Ministry of Special Cases, a play titled The Twenty-Seventh Man, and works that have appeared in The New Yorker and The Washington Post, among other places. In his new novel, Englander illustrates the Israeli–Palestinian conflict via a political thriller that hinges on the complicated relationship between a guard and his secret prisoner.